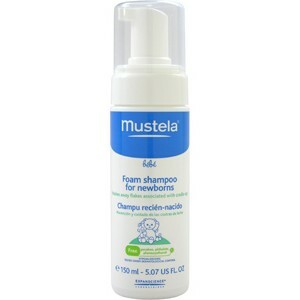 Ultra-gentle, self-foaming shampoo washes away flakes associated with cradle cap. Respects the delicate balance of the scalp in newborns, and prevents skin from drying. Cleanses hair and scalp with its gentle washing base containing coconut extracts. Helps remove cradle cap and prevent its development with the exfoliating action of salicylic acid. Acts on the major causes of cradle cap development and helps limit fungi proliferation. Does not sting the eyes. Does not run into eyes because of its foam texture and easy to rinse.